Wow.. The OS looks so fresh. But the gestures are a bit confusing. And jolla charging 400 euros for this, is not good idea. Good work guys! AnonD-205659, 23 Dec 2013I've been waiting on this for over a year now, and finally got to review it and try it first-h... moresell it to me. AnonD-36414, 24 Dec 2013these jolla guys are like dhoom 3 villian:(irade hain fauladi .i.e. The intentions are big and... morewho said there is no stero recording on wp? also stealing/sideloading apps from other os and run them on a virtual machine is not geting more apps and gamess. these jolla guys are like dhoom 3 villian:(irade hain fauladi .i.e. The intentions are big and strong).Their approach to OS is sexier than the other 3 horses.they gave stereo recording,which wp has failed so far,inspite of microsoft being a giant resourceful company.,the os is simple and sexier after geting used to....practically more apps than wp.gud job jolla,keep it up. LG L9 II hardware for G2 price... As usualy super good optimizations of software will be pointed as reason for shity hardware. Hovewer this phone gona run power hungry android apps in power hungry android system run in virtual machine... Just these freaks chosed the same strategy of nokia xm5800 and n97 (posibly some of them were working on these), some people called these iPhone killers, but in the end they have killed Nokia. Gesture based OS's are the way of the future - it is good for the market to have this product developed. I dont agree that Blackberry is difficult to use at all, in fact I find it better and faster than Android. 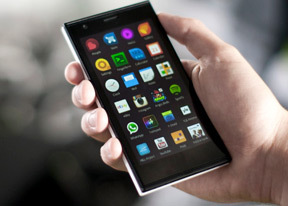 Lets hope Jolla can gain a position in the market as it will be good for consumers. Lets also hope that Blackberry survives for the same reason. BTW I think BB 10.2 is the best out there at the moment. it is simpler to use than blackberry 10? blackberry 10 only got at most 2 gesture to remember and you are good to go. this os have too much gesture to learn. i cant imagine how i will play fruit ninja with this phone. i will of course exit the apps by fault as swiping from left or right will exit the apps. This phone is crap. It need a 42 Megapixel and ability to load Office documents to be competitive. Give it quad core and 4GB and 1080 and maybe it will be good. It do not even have Whats App or Skype. Until then Lumia is king. Even first iphone was not this good it had no auto focus/video recording/apps/wifi/3g and early Androids had hardley anything..New o/s will come along just like Symbian/BB/Windows 6.1/Palm were tops once newer ones will take over. Btw: Please change the "Jolla official photos". The shown doesn't show the final build of the phone (that was the prototype)!! I've been waiting on this for over a year now, and finally got to review it and try it first-hand. I must say, its quite a disappointment. Such a long wait, and not much can be done with the device. Personally, i keep mine at home and only check it out once in a while. There is amazing opportunity for the device, and once licensing and compatibility become a thing of the past, this could really be a top-dog device. I remember when the first Android came out, Nokia was the king of smartphones with its E72 and HTC was the first company who used Google's OS to run a device. People were sceptical, they were amased by the fluidity but the OS had many bugs and many things were missing, the touchscreen Era was at the begening. It-s not the case with Jolla in present, but still, it's a very interesting handset and the OS looks preaty nice and smart when compared with Android. I like the lack of buttons, the simplicity in the menu and the practicality, I think that Android becomes moore and moore complicated. The drawbacks would be, the high price, poor display resolution and the unfinshed OS, but should repair with future updates. Overall, nice smartphone, and maybe in a year or two, a real competitor for Android, WP or IOS. AnonD-134749, 23 Dec 2013its n9 styled, but i think full gesture based os is not good. one who dosent know a bit about.... moreAs you run an Android application, it automatically shows three virtual keys on the screen, one for back, one to check out the list of Android applications in multitask mode and other one I don't know about. I had used N9, all I can say is it takes some times to getting used to gestures but as soon as you learn it, controlling the phone becomes easy. Try a Nokia Asha 501, it's also based on gesture UI. It's pretty interesting to use. Nice preview by GSMArena. Looking forward for an in depth review about the OS. Actually i am waiting for jolla to available as a side load on any android device. Personally i quite like the new swipe in ios7 n always wanted an n9. So i would love to install this on a note2. I am so disappointed. Been looking forward to this for ages and it's just so low spec. Why should I change OS? As an old n900 user the only thing that interests me is the 'other half' thing, mainly because I want a slide out qwerty keyboard. In terms of the UI, it makes no difference to me a whether I have to touch a button to open a menu, or swipe in a certain direction. I don't see the point. I can imagine these on eBay in 6 months time second hand for £100. However if they bought out a keyboard back cover I'd buy one tomorrow.